On the surface, the Razer Phone looks like a sinister version of the Nextbit Robin, whose parent company was purchased by Razer earlier this year. It’s made of black aluminum now, but has the same boxy design, right down to the prominent front camera and sensors. There’s still a fingerprint sensor built into the side power button, though instead of small circular speakers, the whole forehead and chin is covered with tiny holes. Razer's telltale snake logo decorates the rear plate, of course. But under the hood, it shares no comparison to its underpowered, cloud-based predecessor. Why this matters: Razer is one of the top names in PC gaming, and it’s bringing that same mindset to its first smartphone. From the 120Hz screen to the monstrous specs, Razer clearly wants its debut phone to be a pocketable version of its laptops, built for Android enthusiasts with an laser focus on gaming. Even with the Razer name, a $700 phone faces steep competition from Samsung, Apple, and Google, but it could carve out a nice niche with gamers and Android enthusiasts. 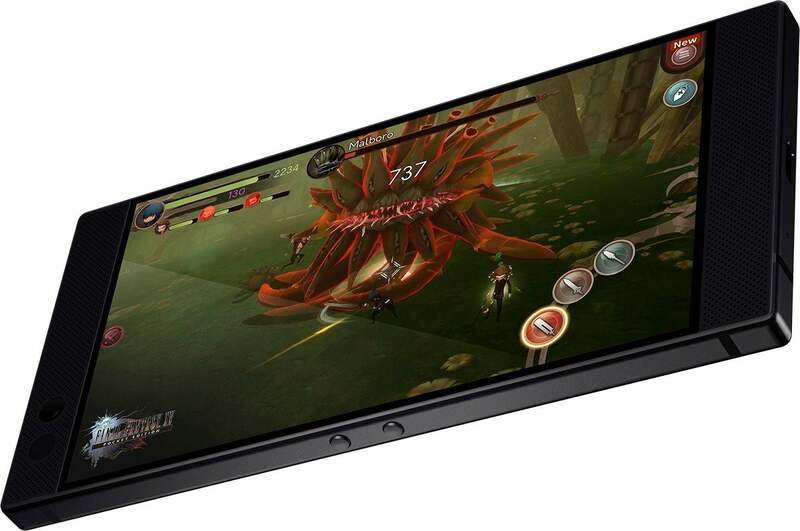 Razer is marketing its new phone to mobile gamers, and its pitch starts with the display. The Razer Phone sports a 5.7-inch QHD 1440x2560 LCD screen with a wide color gamut. Its impressive 120Hz refresh rate—an industry first, according to Razer—is double what most smartphones offer. It's also the same refresh rate you get with the 10.5-inch iPad Pro’s ProMotion display, so it should help games and animations fly. To make sure users get the full experience, Razer has partnered with game makers including Bandai, Tencent, and Square Enix to deliver optimized content. The Razer Phone is built specifically for mobile gamers. Performance-wise, the Razer Phone features a custom-cooled Snapdragon 835 chip and a whopping 8GB of RAM, topping even the Galaxy Note 8’s 6GB of RAM. The camera is pretty powerful too: dual 12MP with a f/1.75 wide-angle main lens and a f/2.6 zoom secondary one, as well as dual phase-detection autofocus. The Razer Phone lacks a headphone jack, but it does come with a 24-bit DAC audio adapter and stereo front-facing speakers with dual amplifiers. Those specs deliver: My colleague Adam Patrick Murray spent some hands-on time with the Razer Phone and came away surprised and impressed at the audio quality. All that power will take quite a toll on the battery, and the Razer Phone has a huge one: 4,000mAh, to be exact. That’s a good deal bigger than the Note 8 and LG V30, both of which have bigger screens than the Razer Phone. The phone will run Android Nougat 7.1.1 out of the box, though Razer says an Oreo update is due to arrive next spring. In a nod to hard-core Android fans, Razer partnered with Nova Launcher for the Razer, which can be further customized via a built-in theme store. Preorders for the Razer Phone begin Thursday, November 3. The phone will cost $699 for 64GB of storage at Razerzone.com, and will be available for purchase at Amazon.com and select Microsoft stores on November 17.